First select your fish! It needs to be one that has scales and fins that stick out. Don't let the fishmonger remove the scales. The one I am using is a New Zealand Terakihi which was being disposed of at the supermarket. Poor thing had lost it's tail and was past it's use-by date so couldn't be sold to be eaten. You can't eat it after you have painted it but you can refreeze it to paint again another time. Dry it off with paper towels and put it on some old newspaper. 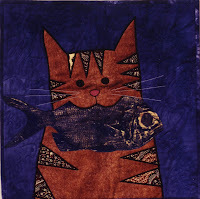 Using fabric paint and a 2 inch housepainting brush, paint the fish upwards towards the head. This forces paint under the scales which gives a better print. Try not to paint too thickly and don't leave brush marks as they will show on your print. Here Fred has been painted with silver fabric painting ink. Move the fish off the paper you painted it on, onto a clean sheet. Try to make the fins stick up and spread the tail out. Lay fabric on top of the fish and gently smooth the fabric over the body and around the sides, making sure you don't squash down the fins or close the tail up. Peel away fabric. Hopefully you have a good print. 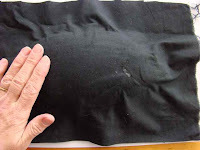 You can also print using acrylic paints and tissue paper or other thin flexible paper if you don't want to use fabric . Wait till the ink is dry. Iron the print to set the ink. Hand wash to remove any fish smell. Well I've thought about lots of things to get prints from, but never a fish - what a good idea. Very easy too. Prawns are good to print too!